People who want to experience trailer camping but would rather ride on a motorcycle than in a truck or SUV may enjoy the Bunkhouse motorcycle camper. Anyone with a standard or larger sized motorcycle can tow this camper, which can sleep up to two people comfortably. 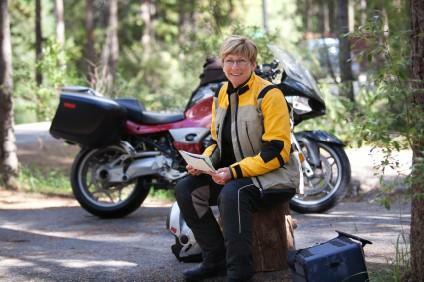 Couples traveling with children can bring two bikes and two campers to accommodate the entire family. The Bunkhouse camper is a pop-up camper, which means that it folds down when not in use and resembles a traditional cargo trailer. When the user arrives at his or her campsite, he or she can assemble it, much like a person would a pop-up tent. The supports are located on the outside, so there is not a lot of bending and reaching required. Bunkhouse campers are not luxury recreational vehicles by any means. They are fairly bare bones. Each camper has a platform sleeping area with a foam mattress and a changing room in front that is similar to a cloth sided one a person may find at the beach. B&F Specialties, the manufacturer of these campers, does add a few conveniences to make the owner's life a bit easier. Camper travel covers to keep the inside clean and dry when it is not in use. A window at the back of the camper makes it easy to reach in to change the linens on the bed. The lid is gas propelled, so most any adult or older teen can set up the camper easily. Awnings on both the front and back end help keep belongings dry. LED lights on the back provide safety on the road. 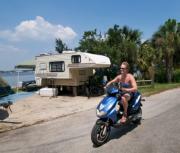 The basic Bunkhouse motorcycle camper, which is called the LX, is 113 inches long, 48.5 inches wide and 38 inches high. This camper features a king size bed, a 6 foot high dressing area with a rolled pan floor, a mini-den formed by setting up the front awning, plastic zip windows and 26 cubic feet of storage area when it is either up or down.There are two options packages available with this camper, dubbed the SE and the Ultimate. The SE package has a clothes caddy, a picnic package with plastic cooler, a table and chrome accents on the hardware. The Ultimate package has all of the features of the SE package plus a shed attachment, carpeting, a removable floor mat, a second clothes caddy and a spare tire. This smaller version of the camper measures only 100 inches long. It has 16 cubic feet of storage space and a full size bed. Its side windows are made of mesh, with just the front window made of plastic. The cover and spare tire are not included in the base price. Both models of Bunkhouse camper are available in two colors: navy and burgundy. They are made out of tent material, which is usually nylon. More options are available on both of these models. They are listed at B&F Specialties' website. The Bunkhouse showroom is located in Illinois at 2481 Delta Lane in Elk Grove Village. Probably the best way to purchase one is to stop by in person. If that is not feasible, the next best option is to look for a Bunkhouse booth at a nearby bike rally. For more information on where to purchase, interested parties can call 847-350-9333.It's also possible to find these campers used on sites like RV Trader. The drawback with finding a camper online, however, is that shipping can be quite expensive if the unit you find is local. It's best for people to purchase an RV this way if they can find a seller in their area.